2016 Trials: D’Ags to Rio! Just because the racing is done doesn’t mean the Trials weren’t over. 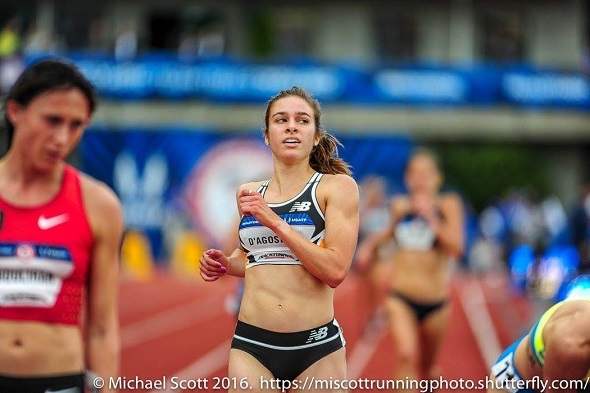 Mark Coogan – former Dartmouth coach and Abbey D’Agostino’s coach at New Balance – announced to Letsrun’s Robert Johnson last night that D’Agostino is on the USA Olympic team as both Molly Huddle and Emily Infeld have elected to run the 5km in Rio. Huddle and Infeld finished first and fourth in the 5km last night but have already made the team in the 10km. Infeld finished 0.27 seconds ahead of D’Agostino. D’Agostino is our fourth confirmed Olympian for this summer’s event, joining Kate Grace, Donn Cabral and Sean Furey. We are awaiting word if Rudy Winkler and Conor McCullough get invitations from the IAAF to compete in the hammer as no one on Team USA has yet to meet the Olympic standard and there aren’t enough people in the world who have met it. Today is the final day of Olympic qualification. There will be word coming out in the next week of official rosters so we will learn who else will officially be Olympians. This entry was posted on Monday, July 11th, 2016 at 7:21 am. It is filed under Olympics, Spotlight. You can follow any responses to this entry through the RSS 2.0 feed.